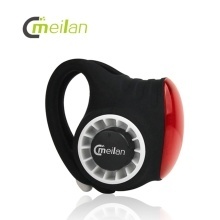 Small volume but large sound, the wireless control bell can be install on anywhere of bicycle for cycling safety and anti-theft. And it supports usb power charge. Use wireless control technology, more convenient to operate. Choose the fixed position anywhere according to user&apos;s preference and save more space. Professional sound chamber design, loud sound, reminding pedestrians or motor vehicles to avoid. COB light source safely lamp, the recognition distance can reach up to 500 meters. Rechargeable battery can normally be used for more than 6 hours in flickering mode.